The government's plans to cut legal aid in England and Wales return to Parliament later, amid opposition from lawyers and campaigners. 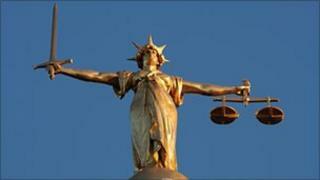 The Ministry of Justice aims to cut £300m from the £2.1bn legal aid bill. Under the plans, people will not be eligible for legal aid in a far broader range of civil cases than at present. The Law Society said the bill would hit the "weak and vulnerable", but Justice Secretary Ken Clarke said legal aid funded some unnecessary litigation. Some debt, housing and benefit issues. The government says that domestic violence cases will still receive legal aid and it intends to expand the definition to include mental and sexual abuse. Mr Clarke has told MPs that the current system "too often encourages people to bring their problems before the courts, even when they are not the right place to provide good solutions and sometimes for litigation that people paying out of their own pocket would not have pursued." He added that legal aid had expanded into areas beyond its original scope. Whatever the unhappiness on the Tory right - at Ken Clarke's revised plans on sentencing - don't expect any further U-turns by the man in the Hush Puppies. For a start, he is already facing a £140m black hole in his budget after his decision last week to scrap plans to allow offenders up to 50% off their sentences if they plead guilty early. The justice secretary simply doesn't have the money for any more concessions. Secondly, temperamentally, Mr Clarke is in no mood for any more climbdowns. Indeed, one suspects he rather enjoys his bust-ups with the Tory right. But there is also a bigger problem. Mr Clarke strongly believes we send too many people to prison and that it costs too much. On that basic belief he will not give ground. Speaking to BBC Radio 4's Today programme, Mr Clarke said: "Lots of people think we should have more and more prisons, and more and more prisoners, and there's lots of lawyers who say we should spend more and more money on lawyers. "[But] we are funding litigation, firstly unnecessarily in less serious matters where really the taxpayers shouldn't pay, and we're also funding litigation where adversarial lawyers are not the best way of sorting out a serious dispute or serious family quarrel." But Linda Lee, president of the Law Society, said people who were denied access to justice may take the law into their own hands and "civil issues become criminal issues". "The people who will suffer are the weak and the vulnerable," she said. "It will be the babies seriously injured in accidents during their birth, for whom there will be no civil legal aid to secure compensation. "It will be the woman looking after her disabled mother, who can no longer get advice when her carer's benefit is wrongly stopped. "It will be the man whose ex-wife will no longer let him see his children." The society, backed by other campaigners and charities, is publishing an analysis of the bill, which says it will end up costing more than it initially saves. "The prime minister and the government want to reduce crime and the deficit," she said. "If they force the bill through Parliament in its current form, they risk the opposite. The bill focuses on only short-term budget-gain and not the long-term consequences. "Ministers must start making the link between cuts to civil legal aid and crime." The Law Centres Federation says that at least 18 of 52 centres serving poor communities could be forced to close because of the cuts. On Monday, Baroness Hale, one of the UK's Supreme Court Justices, became the most high-profile legal figure to question the government's proposals. In a speech she said the reforms would have a "disproportionate effect upon the poorest and most vulnerable in society." "If we really want to spend less on lawyers we have to be prepared to spend more on a very different style of court from the ones which we are used to," she said. "We have to be prepared to spend money on initial advice and assistance schemes because that is where most problems are solved. "Courts are and should be a last resort but they should be a last resort which is accessible to all, rich and poor alike. "The Big Society will be the big loser if everyone does not believe that the law is there for them." Bar Council chairman Peter Lodder said it was a "much-peddled myth" that the legal aid system in England and Wales was more expensive than elsewhere in Europe. But the justice secretary said the system encouraged lengthy, acrimonious and sometimes unnecessary court proceedings at taxpayers' expense and that it could not be compared with other systems of legal aid around the world.